Exciting News: We finally have heat in the car! Way back in Nov.-Dec., SP told me the heat didn't seem to be working. The next time I was in the car, I discovered he was indeed right. Thank goodness the seat warmers were working! "Cool heat" was not pleasant on those 10-15 degree days. It took awhile to get around to having it checked out. You'd think it would have been a higher priority in winter, but with the holidays and him being on call for 2 weeks, well, it got pushed. Yesterday was finally the day. Having heat is nice. The cost to fix it, not nice. He took a slight detour on his way home and brought me a paczki from Bethel Bakery. My first of the season. Yum! I think they're around until March so hopefully I'll get to enjoy a few more. Last weekend we stopped in Prantl's Bakery. I'd never before tried anything from Prantl's. We got a lady lock and a travel burnt almond torte. 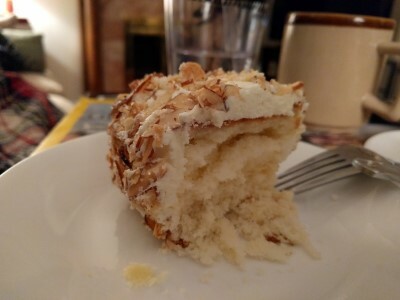 There are people who swoon over Prantl's burnt almond torte. The Huffington Post called it "possibly the BEST cake America has to offer." Keep in mind I don't really like nuts and definitely don't like them on dessert. I also am not a huge fan of plain white cake and white icing. So I was unimpressed. I know. What's wrong with me? I can see why people like it. I just don't. 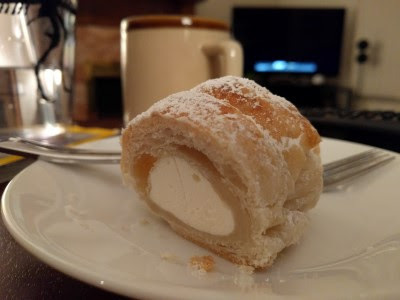 At heart I am a Bethel Bakery girl so while Prantl's lady lock was good, it's not a good as BB's (to me). We finished Season 2 of The Man in the High Castle. We really enjoyed the show and are looking forward to seeing where it goes. We started watching Victoria on PBS. We were surprised to see Rufus Sewell, who plays the American turned Nazi in TMITHC, portraying the Prime Minister. Kind of disconcerting to go from seeing him as Nazi right into seeing him as Prime Minister! Last weekend we watched Kubo & the Two Strings. We both really liked the movie. I read Daisy In Chains by Sharon Bolton. I read Little Black Lies and loved the book so I decided to try another of Bolton's novels. I liked this one a lot, too. I remember reading LBL and at the very end, the last 2 pages, being shocked at the twist. I remember re-reading the last part of the book 3-4 times! DIC didn't surprise me quite as much, but it still had a good twist. I wasn't a fan of the "style" of book, the letters in different print, but I was interested enough in the story to stick with it. Last Sunday we watched the Steelers beat the Chiefs. It was a little stressful! This Sunday is Steelers-Patriots and the winner goes to the Super Bowl. I am a Steelers girl. I have a deep dislike of Shady Brady & Bellicheat. I'm not sure if I should be allowed to watch Sunday's game! I tend to get a little... worked up. Go Steelers!